One of my New Year’s resolutions was to start helping more people, especially the homeless. However, I had trouble doing this because it’s like an invisible barrier has stopped me from doing so. Many years of social conditioning have taught me to look the other way and to completely ignore ‘beggars’, even though at my core I know that such injustice/inequality is wrong. Tonight, I finally broke through the glass wall and began to help people. At first, it felt a bit awkward, but I saw a guy huddled against a wall and had some spare change in my pocket, so I just went for it. So I told him I’d be right back and fetched him a hot drink. As I walked away, I felt very proud of myself and felt the urge to help others. However, a part of me tried to refrain from doing this because I’m not in the best financial situation myself at the moment, but I resolved to at least give away the money left in my wallet. Then the most amazing thing happened. I was just about to approach another homeless guy when I saw that he was already holding a cup of tea! I then turned on to the next street where a Big Issue seller asked someone for enough money to get a cup of tea, to which the man obliged. It was like the universe was trying to show me that there are other generous people out there, so I don’t have to worry about helping everyone. Of course, it is my intention to help as many people as I can, but there is only so much that I can do, so it is reassuring that there are other agents of kindness doing their bit. After this, I encountered a fourth homeless person and gave him some money. He then started chatting and told me how someone had gave him their leather jacket earlier that evening, which he had protested against, but the kind stranger had been insistent. Yet again, another act of amazing kindness! I sat down with him for a while and asked him how long he had been homeless etc. It soon transpired that he was an alcoholic and had been living on the streets for six months and was currently on a waiting list for sheltered accommodation. He said that even though our society is flawed, he takes responsibility for where he has ended up, which is very commendable indeed. After talking with him for a bit, I wished him all the best and carried on home, very pleased that I had finally followed through with a very important goal. Now that I have broken down this barrier, I hope that I can help more people. Tonight, it quickly felt very easy and natural to share what I had, even though I don’t have much money to give. It is inherent within us all to be kind to one another, so I urge you all to share what you can, even if it is just acknowledging that these people exist. Indeed! And we can all give these simple gifts no matter what situations we’re in! It is wonderful what you did and still intend to do. I experienced that next to food and money they are so thankful for someone talking to them and care about their stories. Thanks Erika. And I totally agree.. they must get so lonely and dejected being blanked all the time, so just acknowledging that they exist can make their day! That’s right the point! They are so thankful for just being seen. Greetings, human! 😺 My human and I love what you did- you have a heart of gold and thank you fur reaching out to those homeless you come into contact with! It spreads when real needs are realized; and it is rewarding. I can’t overcome the guilt of not helping. Before I would be very selective in who I helped and in what way, but now I believe I have no right in deciding the suffering of another being. I, like you, am not in the best financial position, but I feel I cannot bear the suffering that befalls many I see on the streets. I did the same just this week and helped a old guy I have seen a few times. I gave him £1 and then wished him a good day. What he does with it is his choice. It is his life after all. And although he may have spent it on alcohol (or he may not have), the withdrawal symptoms of alcohol are terrible. I wouldn’t wish for anybody to suffer in that way. Freedom to choose your own way!! That is my new motto. Reblogged this on Ms. Donnelly's Blog. I find it so difficult to understand why people have a hard time helping the homeless, or just helping people in need. I gave this question a bit of thought a few years ago. This is what I surmised. As individuals we live very protected lives. We drive our vehicles with doors locked and windows rolled up, sometimes with music blaring, or watching movies. That’s what we are teaching our kids. We walk with blinders on, because if we turn our head in any direction we might catch the eye of a homeless person and we don’t believe in enabling him, or her. We also don’t have any spare change. We don’t want to feel empathy, sympathy, compassion, and much less obligation. We won’t offer any help to others in need, because we need every penny we have. 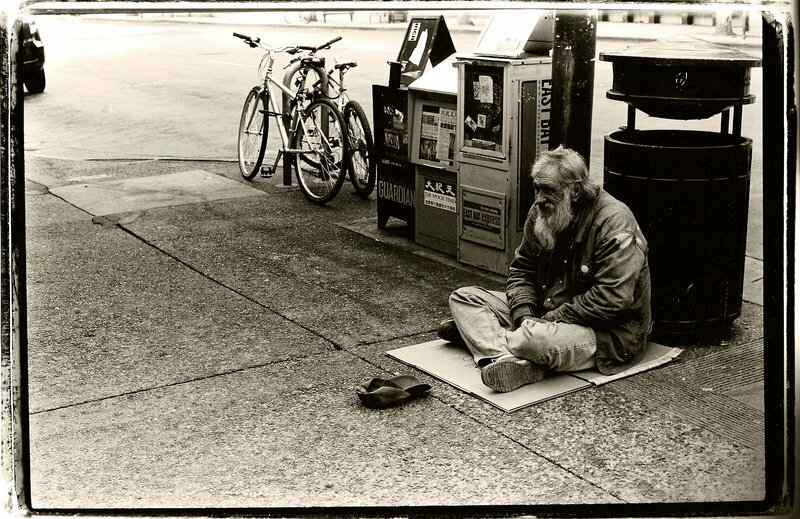 We tend to live as far away as possible from any place where the homeless congregate. We also avoid our friends and family that are having financial problems. We avoid such places and situations like the plague. I could have done better at teaching my daughters money saving ideas, but I could not have taught them any better at how to feel compassion for a person down on his luck, for the homeless guy we pass every morning, for the family begging on the busy intersection, or buying from someone selling tamales or water on the street corner. They are not going to eat what they buy. They just want to help. The thought of “The guy is going straight to buy beer.” does not even cross their mind. They give. They give willingly and they give cheerfully. My youngest daughter does not blink at giving a homeless guy a $20 bill. I taught my girls that they should never loan money if they cannot afford to “not” get it back. If someone asks to borrow money, loan it you can and forget about it. If you must loan out of your need, loan it and forget it. If it comes back to you, praise God. One last thing I taught my girls, live with your eyes wide open, look around, pay attention to what’s going on around you. I taught my girls a lot when they were growing up. This lesson took root. Praise God! IrmMa, you have surmised the situation perfectly. It is society that breeds our ignorance, but it is so comforting to see others trusting in their gut feeling that things aren’t acceptable! And it is also reassuring to see that good values are being passed on to the next generation! God’s Blessings Nick for helping the unfortunate. Life is tough for many, and many on the street are there due to circumstances not of their own making. I know many homeless in our area and some of the stories are heartbreaking when you sit and chat with them over a cup of coffee or a breakfast. I think your kind act of listening to him tell his story, must have been very special to him indeed. I often think about helping the homeless, but I do agree it is difficult to broach the subject with them, knowing so many suffer from mental illness. The most I have done so far is give random dollars to the homeless that hawk the street corners. I am inspired by this post to try and do more.